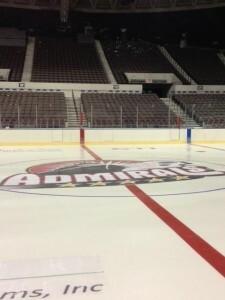 The Norfolk Admirals came into Saturday night’s contest looking to follow-up on the 5-0 victory and sweep the weekend series against their Eastern Division counterpart the Binghamton Senators, the AHL affiliate of the Ottawa Senators. Before the game on Saturday, the Norfolk Admirals were sharing the top seed in the Eastern Conference along with Hartford and Manchester. The Admirals brass elected to start goaltender John Gibsonwhile the B-Sens called upon Nathan Lawson to stand guard in goal. Binghamton’s Darren Kramer tallied the first goal of contest ripping a slap shot that eluded Gibson high to the stick side giving the visitors a one up early in the game. When the buzzer sounded to signal the end of the first frame of play, Binghamton led the way in the shot count 10 to Norfolk’s 5. The B-Sens struck again in the second as Andre Petersson’s point blank shot got the better of Gibson who was pulled out of position by Binghamton’s tape-to-tape passing. Norfolk pulled within one as a Binghamton defenseman coughed up the puck which was picked up by rookie Rickard Rakell who deked his away around Lawson and scored an unassisted goal. Binghamton mustered 13 shots on Gibson during the middle frame while Norfolk had 6 shots on Lawson. The Senators pulled away by 2 midway through the third period as Derek Grant’s slap shot got the better of the rookie keeper Gibson. Forward Jim O’Brien added insult to injury as he landed an empty net shorthanded goal that clinched a 4 to 1 victory for the Senators. John Gibson was handed the loss while Nathan Lawson was rewarded with the win. The final shot count was in Binghamton’s favor outshooting the home team 30 to 24. Yonkman and company continue their four game homestand next weekend as they play host to the Albany Devils, the AHL affiliate of the New Jersey Devils.